Aston Martin has been manufacturing and racing petrol sportscars for well over a century. It was not until 2017 at the 2018 Frankfurt Motor Show, the British automaker revealed the Rapide E, an all-electric version of the Rapide sports sedan, would head into production in the fourth quarter of 2019. Raipde E is expected to rival Porsche's upcoming Taycan electric saloon and could be an alternative to the Tesla Model S.
The Rapide E is a version of the automaker's 4-seater, high-performance sports sedan, the Rapide. But instead of a V-12 engine under the hood, it has a battery pack connected to electric motors at the rear wheels. Though this is only a pre-production prototype, and thus not hosting full product specifications, the electric car is expected to debut in the second half of 2019 with performance capabilities that will rival the Rapide. The pre-production prototype was designed and built with support from Williams Advanced Engineering, a British firm that has extensive expertise in petrol/battery hybrid powertrain for Formula E racing supercars. Williams is expected to aide the auto manufacturer in battery technology development, but at some point, Aston Martin will have its proprietary system, which it will produce in house. Aston Martin President and CEO Dr. Andy Palmer said by the mid-2020s, every sports car in Aston Martin’s growing portfolio will offer a hybrid or a pure battery electric option. 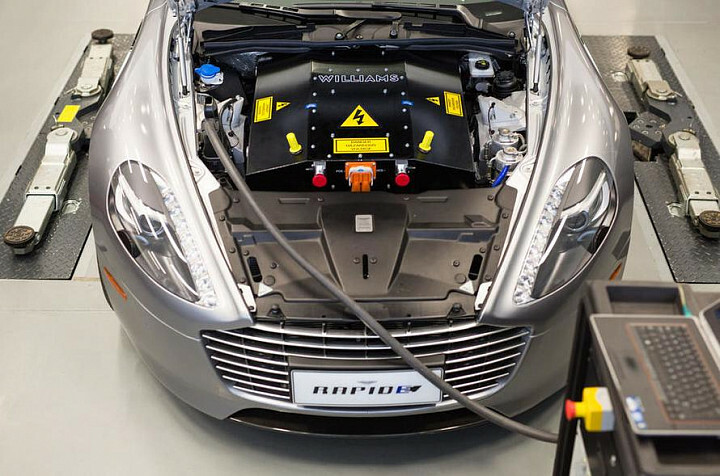 In the first validation of the pre-production prototype, which incorporates the 800V battery electrical architecture with 65kWh installed capacity using over 5600 lithium ion 18650 format cylindrical cells, Palmer tweeted a video on Monday saying this is the "First Validation Prototype Aston Martin Rapide E moves under its own power for the very first time with its breakthrough 800v battery." Rapide E’s range target is around 200 miles under the Worldwide Harmonised Light Vehicle Test Procedure (WLTP). 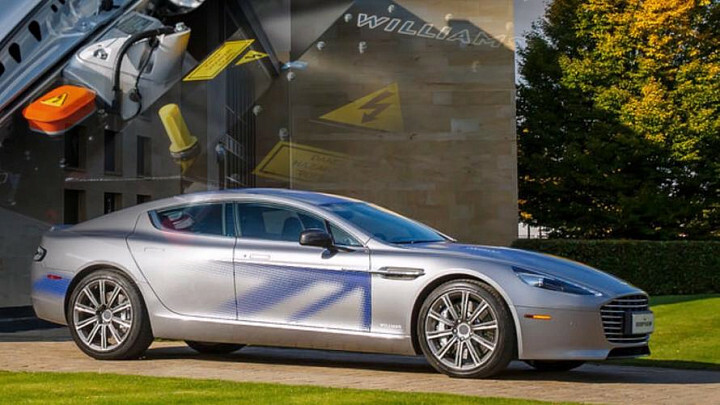 Being an Aston Martin, the Rapide E was designed with high-performance objectives. Projected top speed for the Rapide E is 155mph, with sub-4.0 seconds 0-60mph time and a 50-70mph time of just 1.5 seconds. “Environmental responsibility and sustainability is a global challenge faced by us all. As a career automotive engineer, I’m proud that the car industry is leading the way in finding long-term solutions and reducing harmful emissions. As Aston Martin’s CEO, I take particular satisfaction working with Williams Advanced Engineering and our other associated technology partners to bring Rapide E to reality. As our first all-electric production model, Rapide E will fast-track our knowledge and help us ensure the character and high-performance capabilities of our future EV models and enhance the unique qualities found in all Aston Martins as we know them today. Rapide E will also serve as a critical step on our path to re-launching Lagonda as the world’s first zero-emission luxury marque”. Rapide E will be manufactured at the St. Athan production facility, "home of electrification" for both the Aston Martin and Lagonda brands. Currently, Tesla is dominating the electric vehicle sales market, but that is all about to change as major auto manufacturers around the world are set to offer more all-electric vehicle options in 2019. Aston Martin, Audi, Mini, BMW, Nissan, Porsche, Kia, and Volvo will be flooding the electric car market with new models in the near term.